In the first two parts of this ongoing series, I explained why we are looking for a center-cockpit monohull. It is now time to introduce the specific models we are looking at. Although we have specific boats in mind, we have not yet viewed any of them in person. Because large sailboats are always at least somewhat customized, no two boats of the same model are exactly alike. There are also condition, equipment, and pricing issues to consider. The purpose of this post, then, will be to explain only in general the models we are most seriously considering. We will withhold the specifics until once we have had the chance (hopefully soon) to get down to Florida to kick some tires (hah!--boats don't have tires). There are two threshhold requirements that we believe all of these models meet (and that some otherwise very attractive boats do not). First, the mast height must be less than 65 feet. Some of the marinas in Miami, and most of the nearby sailing grounds, cannot be reached without going under some 65-foot bridges. Second, we need to be able to sail and handle the boat ourselves. We are not looking to take on crew every time we go out for a sail. 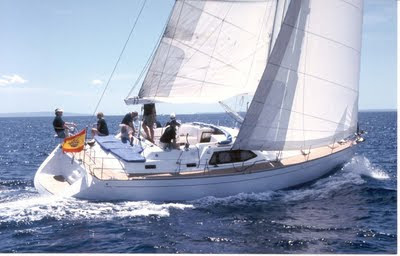 Some things we are looking for, then, are a sail area of less than around 1000 square feet, sail-control lines led to the cockpit, and a design (or equipment, such as a bow thruster) that allows for good maneuverability under power. With that out of the way, on to the boats, from smallest to largest. Although it is small, it is a nice use of space, and might work for us. 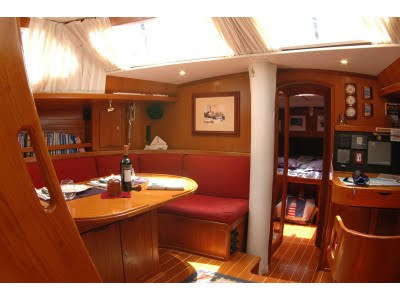 The master stateroom in the back (left) has a centerline queen bed, places to sit, and two hanging closets. It also has a private head. The toilet and shower share the same area, with the sink separate. That is an unusual design, but makes some sense because the toilet and sink are separated by a door so one of us can go to the bathroom while the other uses the sink. The shower, I suppose, will keep the toilet area clean, too, so that is something. The galley has a good amount of counter space, and there is (probably) room for our rug next to the table/settee in the main salon. Although there is only one guest/kids stateroom, it is a traditional V-berth, which is a good use of space because two people can sleep on it with their heads separated. There are also two hanging lockers in the guest stateroom. There is a washer/dryer closet, too. One thing we don't like is that the guest head is a "wet head," meaning that the shower stall is not separate from anything. You shower right in the middle of the bathroom and water gets everywhere. Still, it could work. A bit messier than is ideal, but you can see how bright it is with the large salon windows, even though they are covered in the photo. I also like the molded teak desk chair on the right. ﻿Note the boarding area/swim platform in the back. It can be pretty hard to get in and out of the water from a big boat, and that makes it a lot easier. Also, the decks are teak, which certainly looks sharp. The boat as a whole looks great, too, doesn't it? Finally, here is a brief list of pros and cons of the Northwind 43.
a wet head is how they do things in Korea. it is kind of weird, but not horrible. I'll be used to it when I visit. I remember seeing the same setup in photos of Japanese bathrooms. It is definitely a good space-saver for really dense cities. Or boats. Glad to know you won't have any trouble adjusting. Hi. Looks like a very nice boat but regarding your list of pros I have to tell you that the Northwind shipyard went bankrupt last year. We spent the winter in Port Vell (Barcelona) and the yard is now owned by a company that renovates superyachts. Good luck with your plans – it's a wonderful lifestyle! Thanks for the info, Adam & Camilla. We appreciate you letting us know. I guess we'll need to update our list of pros/cons! It's now 2013 and I'm wondering why you never considered a Nauticat? Or perhaps you did and I didn't read that bit... We purchased a (used) 521 in Naantali, Finland in 1994, and set sail with our kids (8 & 14).. through the Baltic up to Norway, out into the North Sea and the Atlantic, then south into the Med. She was our home until 1996 and we trusted her totally. She sailed us through electric storms when the radar screen was a mass of yellow, she kept us warm when the Atlantic chill in November & December could have got into our bones, she protected us from the extreme heat of the lower Med like in Morocco and Tunisia. Over 7,000 nautical miles, 19 countries and 105 ports/anchorages. She never let us down. Like all Nauticats, the workmanship which built her was beautifully done and we knew if anything had ever gone wrong, it would have been us who had let HER down.... Did we love her? You betta believe it ! Her pilothouse gave us all the opportunity to experience all weathers in comfort and safety. Thank you for your note. We actually were considering a Nauticat 521, but ruled it out early on in the process due to the boat's deep draft. We decided that because we'd be sailing primarily in the shallow waters of Florida and the Bahamas, we didn't want to have a boat with a draft of more than 6 feet. Our boat has a 5ft draft and even at that depth, we've brushed the bottom on many occasions. The Nauticat is a wonderful boat, however. It sounds like you have many wonderful memories. Nice post.I have some words about the construction of Northwind 43.The 43's hull is a hand-laid composite cover of vinylester and polyester resins,glass-fiber matt and wandering around a PVC foam core;a layer of Kevlar cloth is added to the outside to moderate crash harm.The overlay is vacuum stowed and cured under consistent temperature.To counteract osmotic rankling, the outside gelcoat is an isophthalic gum and the submerged territory of the hull is coated with an epoxy barrier coat.Thank you.